These tutoring techniques build the foundation of a positive, productive, and fun tutoring experience. Students spend weeks and months studying details that someone else decided they should study. What’s more, they often have to study them in one way only – by sitting quietly at their desks and listening. How often are they asked, What are YOU interested in? How would YOU like to learn this material? These are powerful questions. Just asking them and listening to the answers will provide you with insight into the student’s situation, and will show the students that you are interested in their feelings and opinions. Meeting students where they are means beginning a tutoring relationship by discovering the student’s learning styles, goals, strengths, and challenges. It's a tutoring technique that will take you far! 1. What are your favorite and least favorite classes? Which subjects are easiest and which are hardest? Is that because of the teacher or the subject? If it’s the teacher, what about them makes them so good/bad, easy/hard? The answers to these questions reveal students’ interests and how they respond to different types of teaching. If they love one teacher because he or she lets them write stories, that’s a helpful clue for your tutoring. If they hate math but then it turns out that’s because of the teacher, then you’ve learned that there may be an opportunity to rebuild their interest in math. Look for patterns like these in their responses. 2. What do you do to study material for a test? What works best for you? Listen carefully to what students have already tried and what they feel has worked and not worked. If they’ve tried something and not liked it – say, they once had to make flash cards to learn vocabulary – you may be able to help them do better with it, but keep in mind there may be some resistance to it from past experience. Look for clues about the student’s organizational abilities (e.g., if they say that taking notes doesn’t work because they always get lost). With this and the first question, you can understand a student’s general learning style. Understanding how a student learns is a crucial tutoring technique. 3. What are your favorite hobbies? Sports? Art? Spending time with friends? This question is an opportunity to not only discover the student’s strengths, but to learn how to relate to that student. What matters to them? Is it sports, is it spending time with friends? 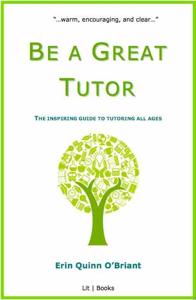 This knowledge, plus the tutoring techniques detailed in the rest of Be a Great Tutor, will help you connect with them personally and will allow you to tailor activities and exercises to their strengths and challenges. 4. When you learn something new in school, do you do best by seeing it on the board, by hearing the teacher say it, or by writing it down yourself? This question offers more insight into the student’s learning style, and offers clues about which of the multiple intelligences are strongest. For example, if a student tells you she likes to learn by taking notes, she may take in information especially well through language. A student who likes to see information in charts, graphs, or photos, may excel in spatial intelligence. When you explain a new idea to this student, try using a method that corresponds to his or her learning preferences. 5. Do you like school in general? What do you think of doing after school – what’s your dream job? This question helps you connect with the student’s motivation, and reveals to what extent the student is motivated externally (e.g., “I get good grades because my parents make me,” or “my parents think I should be a doctor”) vs. internally (“I love English class and reading,” or “I want to be an astronaut because I’m interested in outer space”). You can then include these interests in lessons, making the subject material far more meaningful and relevant to the student. For example, if a student is fascinated by outer space, you could frame a difficult math problem by involving an astronaut, or offer the possibility of a project built around studying astronauts. This helps you build a bridge between the student’s interests and their challenges. Making that connection is one of the most effective tutoring techniques. These questions and answers will begin a personal relationship and offer clues as to how to work with and motivate one particular student. And don’t stop asking questions -- students change continually, and it’s critical that you continue to understand their motivations and interests. For example, when reviewing a completed test or paper that a student has shared with you, begin by asking them what they felt was hardest and easiest about it. Ask them where they think their strengths and weaknesses are in the subject. Then, go through the test and let the student see the logic you use to analyze it: mark down which questions were easy, and for difficult or incorrect questions, make note of which types of problems were most challenging. For questions they got right, ask them how they did it. As you analyze their work in this way, you respect their strengths – building confidence – and you teach them how to analyze their own work by sharing your logic with them. Then, you have a simple list of goals to work from and you know the specific issues and challenges a student is facing. The rest of this chapter (plus 10 more chapters full of helpful information for tutors) is in my book, Be a Great Tutor. Looking for tutoring jobs? Here's my advice. Find out how to apply your tutoring techniques and start a tutoring business.